Pyridoxine, also known as vitamin B6, is a water soluble B vitamin that is commonly bound to protein. The essential vitamin plays a central role in the metabolism of amino acids. Pyridoxine is also important in the cellular metabolism of carbohydrate, protein, and fat. Likewise, the nutrient facilitates the formation of neurotransmitters and the production of nicotinic acid. Chicken, beef liver, dairy products and yeast extracts are primary sources of pyridoxine. Fish — especially tuna, trout, and herring as well as halibut and salmon — also contain high levels of pyridoxine. Likewise, nuts and whole grains are rich in this vital nutrient. Some fruits and vegetables are known to contain fair amounts of pyridoxine. These food sources include lentils, beans, spinach, and carrots as well as raisins, bananas, and cauliflowers. Pyridoxine is an essential nutrient that is best known for its positive effects on cardiovascular health. An entry posted on the University of Maryland Medical Center website noted that pyridoxine deficiency may lead to heart disease. According to the page, the nutrient promotes heart health by reducing the levels of homocysteine. This is a harmful compound associated with the onset of various cardiovascular diseases. The beneficial compound is also shown to reduce blood cholesterol levels and promote blood flow in the arteries. Pyridoxine is helpful in maintaining bone and joint health too. Preliminary studies have shown that the compound relieves inflammation and symptoms of carpal tunnel syndrome. Likewise, the beneficial nutrient is remarkably effective in alleviating rheumatoid arthritis. The compound is shown to treat a movement disorder called tardive dyskinesia as well. The essential nutrient is also highly effective in promoting female reproductive health. Past studies reveal that pyridoxine may help improve symptoms of premenstrual syndrome. In other studies, the compound is actually known to relieve nausea and vomiting during pregnancy. A large study has previously shown that daily pyridoxine intake at a 30 mg dosage helped reduce morning sickness in pregnant women. The nutrient is also used to address symptoms associated with the onset of menopause. The compound is used to promote brain health as well. Pyridoxine is found to play a key role in serotonin production, which in turn reduces the risk of depression. It is also utilized in the treatment of Alzheimer’s disease, attention deficit hyperactivity disorder (ADHD), Down syndrome, and autism. An article posted on the Tip Disease website also stated that pyridoxine is important in cancer prevention and management. According to the article, the body uses the nutrient as some form of biochemical defense against many forms of cancer. Adequate levels of pyridoxine is, in fact, needed by patients suffering from breast cancer. Bladder tumors are also found to be slightly reduced following pyridoxine intake in one study. Pyridoxine is best known for its beneficial effects on the body’s cardiovascular profile. Likewise, it is known to support the bones and joints, the brain and the female reproductive health. The nutrient also promotes muscle health and improves both skin and eye conditions. Pyridoxine staves off cardiovascular diseases and various types of cancer. Pyridoxine alleviates carpal tunnel syndrome and rheumatoid arthritis. 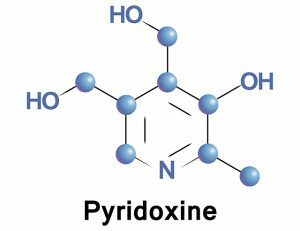 Pyridoxine addresses tardive dyskinesia, hyperkinesis, and chorea. Pyridoxine keeps Alzheimer’s disease, ADHD, Down syndrome, and depression. Pyridoxine also relieves seizures, convulsions, asthma, and menstrual issues. Pyridoxine helps protect the heart, brain, muscles, and the lungs. Pyridoxine improves the eyes, skin, and female reproductive health.